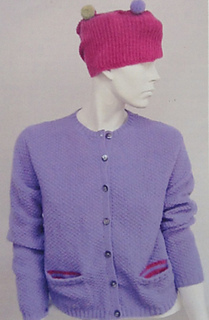 Lavender Blue is a cardigan knit in a textured basket stitch with inset pockets knit in stripes in a contrast yarn. It is a shorter/cropped length, has set-in sleeves and a button-up front. 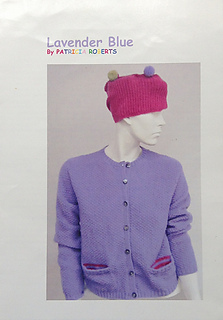 The design is offered in three yarn options: cashmere, lambswool or cotton. The cardigan requires 7 balls of the Cashmere or Lambswool No 1 or 9 balls of the Fine Cotton.